Field-based sales models are out; inside sales solutions are in! Instead of staffing large and expensive teams of sales pros who travel around hawking their products, B2B companies around the world are increasingly adopting remote selling technologies and tactics that drive higher revenues and keep costs low. So, just pick up a phone, dial your potential customer, and send them the contract after a half hour of talking about how great your product is. Pretty neat, right? Hang on – it’s not that simple. There’s actually a lot more thought and care that goes into ensuring you win a new customer. 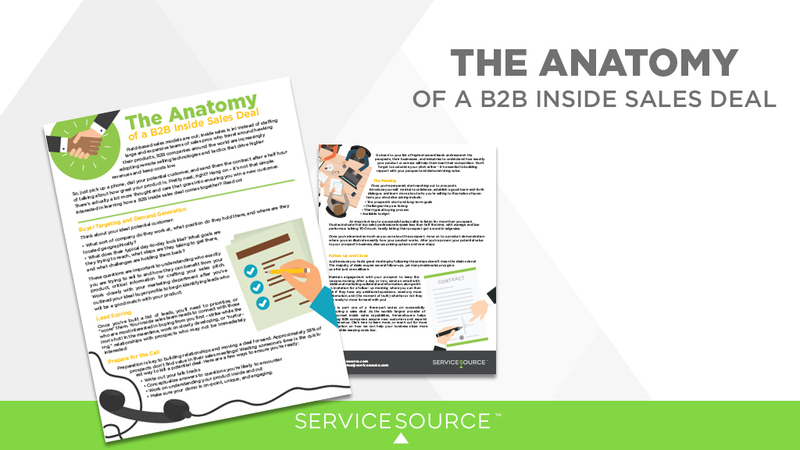 Interested in learning how a B2B inside sales deal comes together? Read on! What sort of company do they work at, what position do they hold there, and where are they located geographically? What does their typical day-to-day look like? What goals are they trying to reach, what steps are they taking to get there, and what challenges are holding them back? These questions are important to understanding who exactly you are trying to sell to and how they can benefit from your product, critical information for crafting your inside sales solution. Work closely with your marketing department after you’ve outlined your ideal buyer profile to begin identifying leads who will be a good match with your product. Make sure your demo is on-point, unique, and engaging. Go back to your list of highest-scored leads and research the prospects, their businesses, and industries to understand how exactly your product or service will help them beat their competition. Don’t forget to customize your pitch either – it’s essential to building rapport with your prospect and demonstrating value. Available budget An important key to a successful sales call is to listen far more than you speak. Studies indicate that top sales professionals speak less than half the time, with average and low performers talking TOO much, hardly letting their prospect get a word in edgewise. Once you’ve learned as much as you can about the prospect, move on to a product demonstration where you can illustrate exactly how your product works. After you’ve proven your potential value to your prospect’s business, discuss pricing options and next steps. Just because you had a great meeting by following these steps doesn’t mean the deal is done! The majority of deals require several follow-ups, yet many inside sales pros give up after just one callback. Maintain engagement with your prospect to keep the process moving. After a day or two, send an email with additional marketing collateral and information, along with an invitation for a follow- up meeting where you can then ask if they have any additional questions, need any more information, and (the moment of truth) whether or not they are ready to move forward with you! This is part one of a three-part series on successfully executing a sales deal. As the world’s largest provider of outsourced inside sales capabilities, ServiceSource helps leading B2B companies acquire new customers and expand their revenue. Learn more on how we can help your business close more deals while keeping costs low.